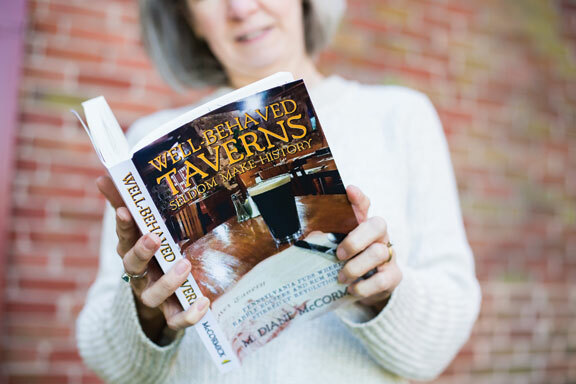 The insurrectionist past truly comes to life in M. Diane McCormick’s new book, Well-Behaved Taverns Seldom Make History: Pennsylvania Pubs Where Rabble-Rousers and Rum Runners Stirred up Revolutions. McCormick, a long-time freelance journalist for Harrisburg Magazine and other local publications, takes her readers on a pub crawl through 12 Pennsylvania taverns where stakes were high and the rum was flowing. The 312- page book spotlights the heroes and scoundrels of the American Revolution, Whiskey Rebellion, the boozy Fries Rebellion, the tumultuous Canal Era, the Underground Railroad, the Battle of Gettysburg, the Molly Maguires, and Prohibition. McCormick says she got the idea for the book after having a burger and a glass of Sly Fox O’Reilly Stout at the Jean Bonnet Tavern in Bedford during a family trip in 2016. She includes the Jean Bonnet Tavern, hotbed of the Whiskey Rebellion, in the book along with City Tavern, Philadelphia; General Warren Inn, Malvern; Blue Bell Inn, Blue Bell; McCoole’s at the Historic Red Lion Inn, Quakertown; Tavern at the Sun Inn, Bethlehem; Black bass Hotel, Lumberville; Doobin House Inn, Gettysburg; Farnsworth House Inn and Sweney’s Tavern, Gettysburg; Wooden Keg Tavern, St. Clair; Two Rivers Brewing Company, Easton; and Horse Inn, Lancaster. McCormick says legend has it there was a hanging in the Jean Bonnet and she includes what she has discovered about the longstanding story into her discussion. McCormick also includes many other legends that have withstood time about each tavern she includes in the book. However, she says while a lot of the legends were fun stories, sometimes the real story wasn’t as dramatic. “I just tried to make it very clear that when I was getting into the legendary territory, sometimes there was the true story of what happened,” she says. The book is also a guide to the taverns as they stand today, and McCormick includes descriptions and details about their culinary and beverage cuisines as patrons currently find them. McCormick also includes information at the end of each chapter about what is nearby so folks can explore other places of note. McCormick holds a bachelor’s degree in journalism from Indiana University of Pennsylvania, and master’s degrees from Penn State University in American studies, and from Goucher College in creative nonfiction. When asked the million dollar question, “Do you plan on writing another book?” McCormick says she is currently has two battling book ideas competing in her mind. “I’ve definitely been bitten by the book bug,” she says. Well-Behaved Taverns Seldom Make History: Pennsylvania Pubs Where Rabble-Rousers and Rum Runners Stirred up Revolutions by M. Diane McCormick is available from Sunbury Press at www.sunburypress.com and in select bookstores.